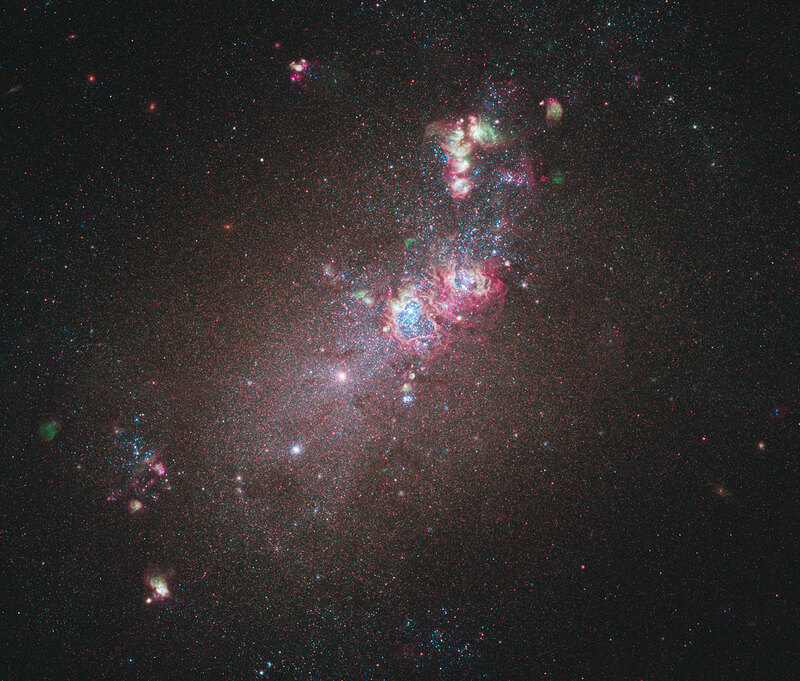 Hubble’s newest camera has taken an image of galaxy NGC 4214. This galaxy glows brightly with young stars and gas clouds, and is an ideal laboratory to research star formation and evolution. Size isn’t everything... in astronomy, at least. Dwarf galaxy NGC 4214 may be small, but what it lacks in size it makes up for in content. It is packed with everything an astronomer could ask for, from hot, young star-forming regions to old clusters with red supergiants. The intricate patterns of glowing ionised hydrogen gas, cavities blown clear of gas by stellar wind, and bright stellar clusters of NGC 4214 can be seen in this optical and near-infrared image, taken using the Wide Field Camera 3 (WFC3) instrument on the NASA/ESA Hubble Space Telescope. A huge heart-shaped cavity — possibly the galaxy’s most eye-catching feature — can be seen at the centre of the image. Inside this hole lies a large cluster of massive, young stars ranging in temperature from 10 000 to 50 000 degrees Celsius. Their strong stellar winds are responsible for the creation of this hollow area. The resulting lack of gas prevents any further star formation from occurring in this region. Located around 10 million light-years away in the constellation of Canes Venatici (The Hunting Dogs), the galaxy’s relative close proximity to us, combined with the wide variety of evolutionary stages among the stars, makes it an ideal laboratory to research what triggers star formation and evolution. By chance, there is relatively little interstellar dust between us and NGC 4214, making our measurements of it more accurate. NGC 4214 contains a large amount of gas, some of which can be seen glowing red in the image, providing abundant material for star formation. 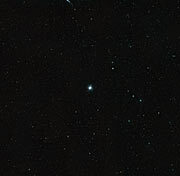 The area with the most hydrogen gas, and consequently, the youngest clusters of stars (around two million years old), lies in the upper part of this Hubble image. Like most of the features in the image, this area is visible due to ionisation of the surrounding gas by the ultraviolet light of a young cluster of stars within. Observations of this dwarf galaxy have also revealed clusters of much older red supergiant stars that we see at a late stage in their evolution. 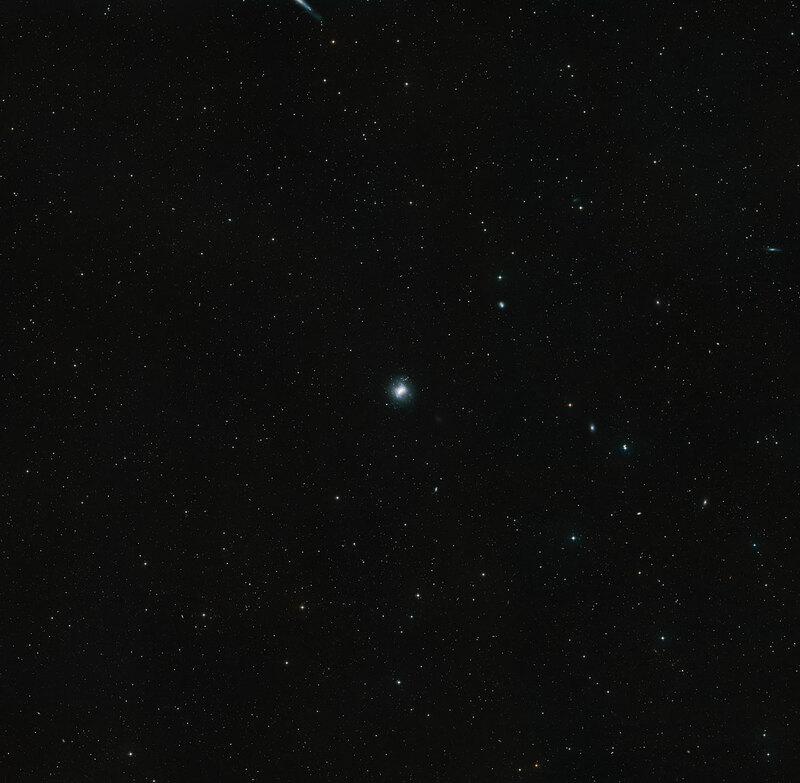 Additional older stars can be seen dotted all across the galaxy. While these are dominant in infrared emission they can only be seen shining faintly in this visible-light image. The variety of stars at different stages in their evolution, indicate that the recent and ongoing starburst periods are by no means the first, and the galaxy’s numerous ionised hydrogen regions suggest they will not be the last.